What could have been my friend George’s advice to me for my – let’s say fragrant – feet was instead being broadcast from a monk’s recording. 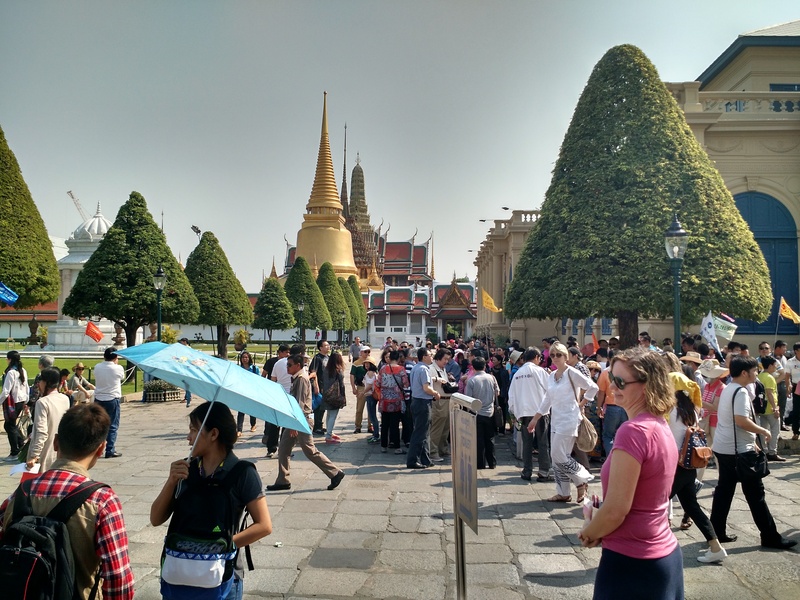 It seems Wat Saket (or the Golden Mount) is aware that the steps to the dome shaped Buddhist shrine are slippery, and so has a recording to tell visitors that unlike temples, at the chedi you don’t need to remove your shoes. The relief of my fellow fragrant pilgrims was palpable. We have had our busiest and fullest (in every sense) day. Bangkok, though not hot at the moment, is where we have received the warmest welcome of T’s college friend and his wife. They have opened their home and shared their knowledge; T mentions a love of grocery stores to scope out local snacks and they transport us to Gourmet Market, which makes Whole Foods look like the Russian Safeway from college. We were dropped in the morning at the Grand Palace and met at the end of the day at the new Dusit Palace. Though being driven around was pure luxury in this busy city, I think we most enjoyed hearing the perspective of two locals. And I even got a brief lesson on how the Thai language with its five different tones can be represented on a keyboard! Of the many highlights of the day, I will mention a few. 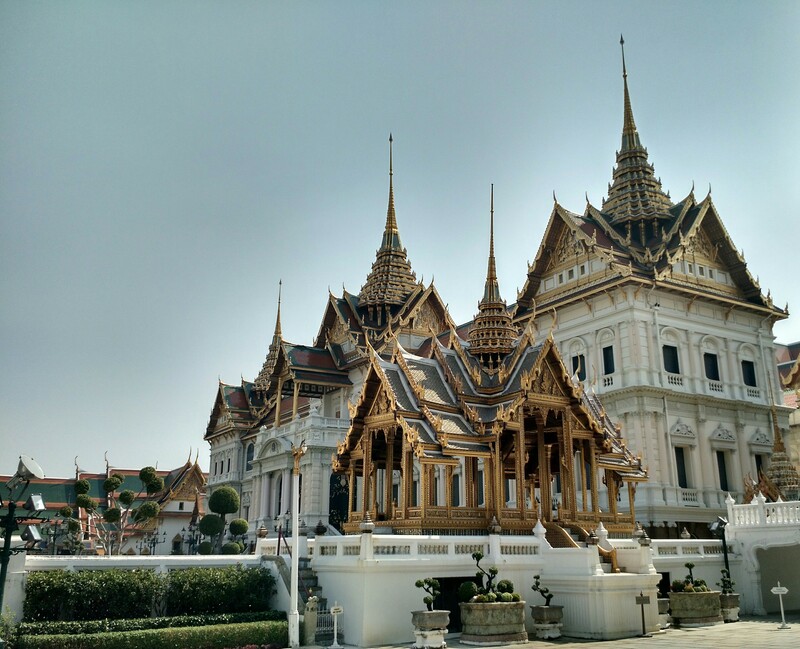 The Grand Palace of Siam days is as impressive as the Alhambra in Spain. 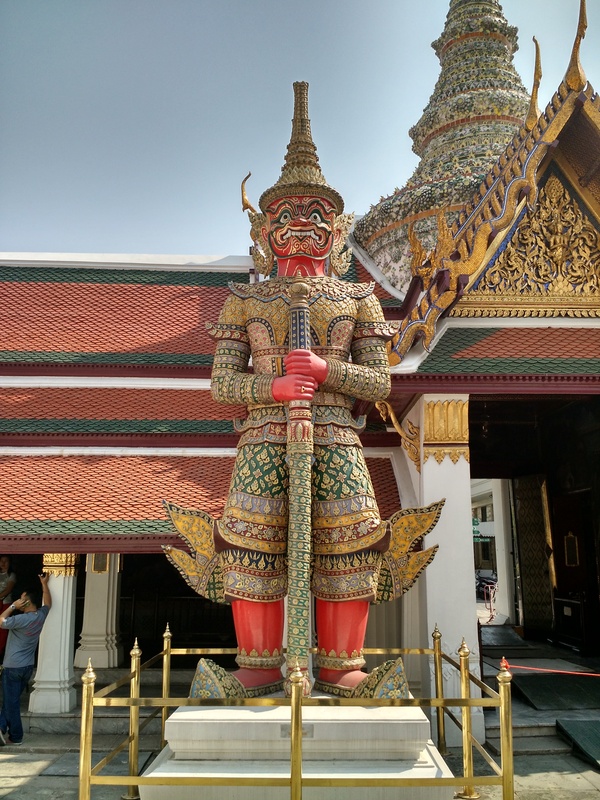 The awe inspiring beauty, with the Emerald Buddha, throne rooms and art had been described in the book Four Reigns that I had read, but only a picture can start to do it justice. Its popularity can likely be quantified in the number of selfies taken there. T even got to borrow pants when his cargo shorts were deemed too short; the counter worker must have known he wouldn’t wear the colorful elephant pants others were offered, and loaned him a plain green pair we were tempted to keep! On the walk to lunch, a soccer team of 11 year old boys stopped to practice English and share high fives, which brought smiles to all. We made a brief lunch stop at Khao San Road, popular with backpackers and those who saw The Beach. We only saw hipster mustache shirts and tailored suits for sale, but apparently if we’d looked closer we could have picked up a spare passport. The sightseeing wound down at the new Dusit palace which was built in 1900, or four kings ago. I now feel like I’ve been to Versailles. To continue with modernity, we went to the mall for dinner. Our ever gracious hosts caught wind T liked Som Tom salads (with shredded spicy green papaya), so took us to a restaurant of that name. The bottom floor of the mall was mostly desert places, so we made another stop to enjoy a melting chocolate bomb and watching a few first dates. More Tom and Maria photos! !